A serious candidate for Congress has no business taking an eleven day vacation overseas with less than two months to go before the election. This is a time when anxious Congressmen are cooling their heels to get out of DC to campaign back home and explain why so little has gotten done. It’s the other party’s fault of course and I couldn’t agree more. One last photo of Copenhagen which somehow seems appropiate to the tourist experience. 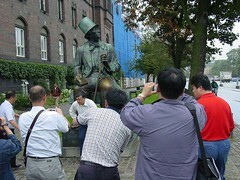 Its the engaging statue of Hans Christian Anderson nodding towards Tivoli. His brass knees are shiny from all the attention.